Flag Frenzy is a fast-paced card game where players race to match flags from countries around the world! 49 cards have 8 flags each, and every card has one flag in common with every other card. The goal is to find the matching flags before your opponents do, and be the first to match all your cards. 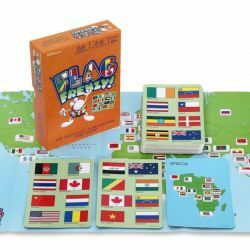 Continent cards add to the fun, as players must match a flag to one of four continents (Europe, Asia, Americas, and Africa). And a bonus world map is included, showing all flags and where the countries are located. Contents: 49 flag cards, 8 continent cards, rules, world map.